Oakenshaw is a fictitious West Yorkshire mill town set in the early 1960's located somewhere near to the real town of Keighley on the Airedale line. Like so many of the Yorkshire mill towns the layout portrays a town in a valley centred around a river crossing. Regional boundary changes in 1957 brought this former Midland Railway Station into the short lived North Eastern Region of British Railways. 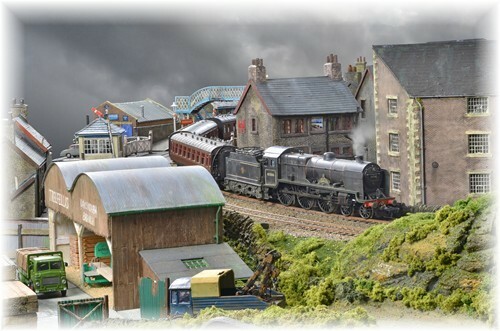 The station is very much based on Midland Railway practice and the scale is 4mm using "OO" gauge fine scale code 75 track. All the buildings on the layout are scratch built, mainly using thick card for the basic structure. These were covered with plasticard to replicate stone or brick finishes. The structures have then been painted and weathered to represent the prototypes from the area. The fiddle yard features sixteen roads and is capable of holding 24 separate trains. All the buildings on the layout are scratch built, mainly using thick card for the basic structure. These were covered with plastikard to represent stone or brick finishes. Trains are made up of correctly trains for the era and location that are hauled by a mixture of steam and diesel locomotives. Expenses: We would expect reimbursement for out of pocket expenses for members and or The Club following the exhibition of this layout. The transport for this layout would involve the hire of short wheel base Transit type van.